This set of Biochemistry Multiple Choice Questions & Answers (MCQs) focuses on “Enzyme Kinetics as an Approach to Understanding Mechanism”. 1. Which of the following is true about Michaelis-Menten kinetics? Explanation: Km is defined as that concentration of substrate at which enzyme is working at half of maximum velocity. It is also a measure of the affinity that the enzyme has for its substrate. Michaelis-Menten kinetics assumes non-covalent binding between enzyme and substrate. 2. When the velocity of enzyme activity is plotted against substrate concentration, which of the following is obtained? Explanation: At low substrate concentration, the rate of a reaction is determined by the rate of formation of an enzyme-substrate complex. 3. Which of the following is the correct Line weaver-Burk equation? 4. Which of the following statements is true about competitive inhibitors? Explanation: Competitive inhibition is a common typ of reversible inhibition. The apparent Km increases in the presence of inhibitor by a factor α. The maximum velocity for the reaction remains same in the presence of a competitive inhibitor. 5. Which of the following statements is true about uncompetitive inhibitors? Explanation: They bind non-covalently at a site distinct from the substrate active site. They decrease the measured Vmax⁡ and also apparent Km. Explanation: The breakdown of ES complex is the rate determining step of Michaelis Menten kinetics. Explanation: An inhibitor is a substance which interferes with the substrate-active site binding and slows down the catalytic rate. 8. Which of the following is an example for irreversible inhibitor? Explanation: Disulfiram, Oseltamivir and protease inhibitors are reversible inhibitors. 9. Which of the following is an example of reversible inhibitor? Explanation: DIPF, Penicillin and Iodoacetamide are irreversible inhibitors. 10. Where does inhibitor binds on enzyme in mixed inhibition? Explanation: The inhibitor binds at a place different from active site allosterically. 11. The catalytic efficiency of two distinct enzymes can be compared based on which of the following factor? Explanation: Km is the substrate concentration. Increased substrate concentration increases the rate of reaction. 12. What is the general mechanism of an enzyme? Explanation: For the reaction to occur at a faster rate, activation energy should be less. 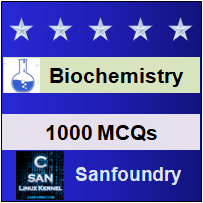 To practice all areas of Biochemistry, here is complete set of 1000+ Multiple Choice Questions and Answers.